This past Saturday we ate at Trattoria Ponte Rosso. The lunch was simultaneously satisfying, light, inventive and delicious—almost the same adjectives I would use to describe the place itself, tucked into one of those ancient, slightly sagging buildings on one of the old canals of Milan. We will definitely be going back (without the children). My minestra di primavera (spring soup) was a symphony of seasonal delicacies: fava beans, baby peas, artichoke, and asparagus. And my husband’s almost-vegetarian fritto misto hid surprises not commonly found in such dishes: apple slices, sweet potato, a down-sized arancino*, and zucchini flowers stuffed with mozzarella and anchovy. But it was the start of the meal that set the tone: two striated constructions, featuring as their primary building blocks croccanti di parmigiano. Parmesan crisps. 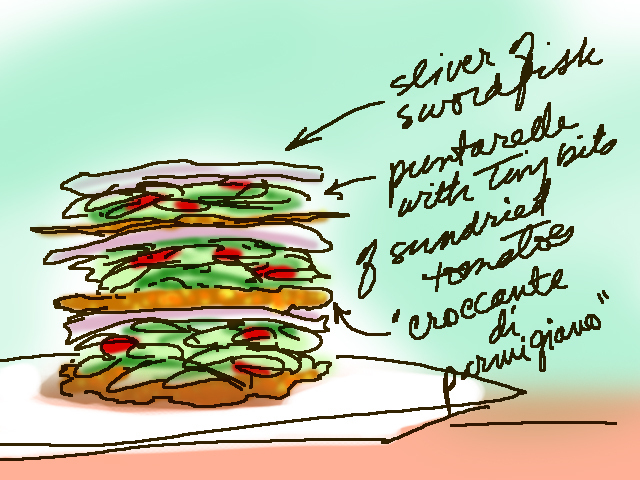 One was layers of crisp, puntarelle dressed in the traditional fashion with the addition of slivered sun dried tomato, and smoked swordfish. 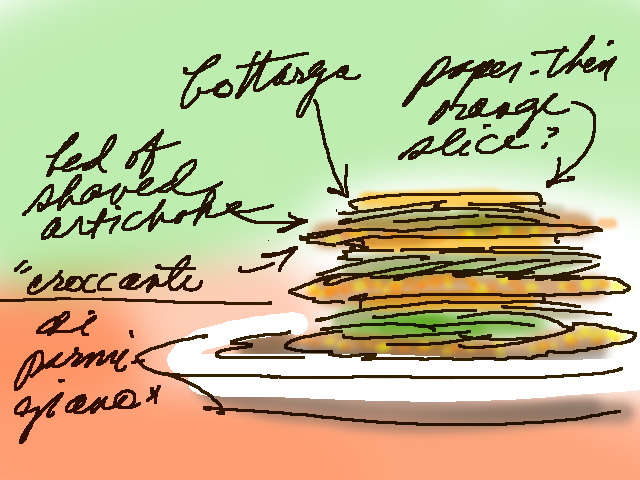 The other was layers of crisp, thin-sliced artichoke in a light dressing, shavings of bottarga (tuna roe), and orange. I never understood if the essence of orange came from actual thin slices or simply from the use of juice in the dressing, but it was decisively present and a perfect balance to the pungent saltiness of the bottarga. As we ate these texturally rich salads, it dawned on me that with the exception of the bottarga and the smoked swordfish, we were enjoying ingredients and preparations that we eat commonly. But they were made more special by the parmesan crisps, which are, in fact, as the Italian say un bel niente. A big nothing, literally, but in this case, let’s say, “No big deal.” I’ve cruised around on the internet, only to discover that they are quite simple to prepare. One method is to grate smallish heaps of parmesan cheese onto a baking sheet covered with parchment, then leave them in a hot oven until browned. The other method is to grate the cheese in a non-stick frying pan and, once browned on the underside, to flip it with the help of a spatula to brown the other. The resulting golden, chewy mass becomes crispy when it cools. And there—apparently—you have it. Probably easier described than done, but surely nothing that a little practice can’t master. In any case, the effect on the dish and in the mouth is much greater than the difficulty required to prepare it, and with a little creativity you could lift quite normal dishes to an entirely different level. A final note: The restaurant’s website speaks rather eloquently about the philosophy of the cuisine, placing heavy emphasis on the role that memory plays in the preparation of their dishes. As Italian cooking ranges in its most exquisite expressions from the work of great chefs to the daily labor of mothers and grandmothers in the kitchen, it is a cuisine kept alive by those who dip again and again into personal knowledge and instinct about “how things are done” (tradition) while, inevitably, giving it their own mark. So memory is as critical an ingredient as individual interpretation, if not more so. The memory of the chef goes into the final preparation, but the memories of the consumer are sparked at the table. What did the parmesan crisp bring to mind? What wordless memory did it conjure? Putting it into words would be like describing a dream after waking—dull, inaccurate and beside the point—so I won’t. Suffice it to say that while I was living this particular dream, the experience was rich. *An arancino is a Sicilian concoction: a breaded, fried rice ball often filled with cheese or meat. This entry was posted in ITALY, SAVORING and tagged cooking, croccante di parmigiano, memory, parmesan crisps, trattoria ponte rosso. Bookmark the permalink. Are you creating food and travel reviews for any publications past your blog? Your descriptions and art are so evocative of the best effects both have on our senses. No I am not…but it’s an idea. I need to find something to do. Freelance is all but dried-up, for the moment, and always less satisfying, unfortunately. So I’m contemplating a shift. Italy remains a challenge professionally…not a cornucopia of opportunity. You are making me very hungry. I’m always hungry. I guess it’s contagious. my little buttercup loves parmesan — eats it straight out of the container — so this little crisp is something we may have to try at home. thanks! I didn’t know she loved Parmesan…it’s SOOO good for you…does she know that? Excellent source of calcium and protein and, as cheeses go, not very fat. If she can find it, she might also like Grana di Padano…very similar but less fat. And, yes, you must try these!